In 1947, Nathan Horwitt designed a wristwatch with a plain black face without numerals and a white disk marking the 12 o-clock position. The following year, his design was produced, without credit or compensation, by Zenith Movado. It was a prime example of design piracy, and Horwitt sued, but justice would take 27 years. 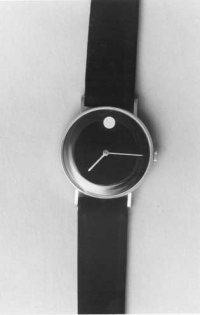 In the meantime, the design was placed in the permanent collection of the Museum of Modern Art in 1960, and become known as "The Museum Watch.". In 1975, Movado finally settled with Horwitt for $29,000 and after Horwitt’s death, Movado heavily promoted Horwitt and his classic "Museum Watch." Nathan George Horwitt (1898-1990) was already a well-known designer before the Movado watch. He had designed the Beta chair for the Howell Company in 1930, which was displayed in the famous New York Machine Art exhibit in 1934, along with work by other pioneer industrial designers like Walter Dorwin Teague. The Movado watch was not the only famous watch in design history. In 1904 Frenchman Louis Cartier designed a special wristwatch for air pioneer Alberto Santos-Dumont, a Brazilian living in Paris who built a series of fourteen single seat airplanes and achieved the first European successful flight. In 1918, Cartier designed the Tank Watch in honor of members of the US tank corps for their defense of France during the war. The Tank Watch became enormously popular in the US. Then in 1932, Henry Dreyfuss designed a tabletop alarm clock produced by Westclox, followed in 1939 by his classic Big Ben alarm clock for them. In 1949, a unique "ball" wall clock with individual projecting balls radially arranged to represent each hour, was manufactured by the Howard Miller Clock Company. It was sometimes called the "atomic" clock for its resemblance to then-popular atom symbology. Designed by George Nelson in 1947, it was the first of many modern clock designs he designed for the company. In 1983, The Swatch Watch, designed by engineers Jacques Muller, Ernst Thonke and Elmar Mock in 1980 to enable the Swiss watch industry to compete with under-$75 Asian digital watches, was introduced at $40. It was an ingenious design of miniaturization and part reduction, but rather conservative in appearance. The next year, Max Imgrüth, president of Swatch Watch USA, introduced innovative colors and patterns that exploded into a new fashion watch market.